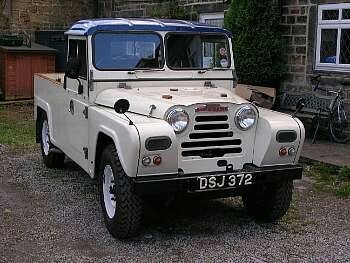 The Austin Gipsy was Austin's attempt at an off-road capable vehicle to compete with Rover's Land Rover. Austin picked the name with an "I" spelling rather than gypsy. The Gipsy was visually similar to the Land Rover, but unlike the Land Rover, the Gipsy's bodywork was steel and suffered badly from rust in the outdoors off-road environment it was intended for. The suspension was sophisticated - independent suspension all round, using 'Flexitor' rubber springs. Later models used leaf springs on the front and rear which was felt to offer a greatly improved ride over rough surfaces. It used either a BMC 2199 cc petrol based on the one in the Austin A70 car: by the 1960s the compression ratio was unfashionably low, making the petrol powered vehicle unusually tolerant of low octane fuel.A 2178 cc diesel engined version was also offered. It was available initially in a 90 inch (2286 mm) (later known as the Short wheelbase (SWB) version to which was added a 111 inch (2819 mm) Long wheelbase (LWB) from Series II. With the merger of BMC with Leyland to form British Leyland the Austin Gipsy and the Land Rover were being produced by the same company. Production of the Gipsy was stopped after some 21,208 vehicles had been sold.